I read an article on the homeless, and felt compelled to do this piece. Prior to retirement, my work had occasionally brought me into contact with those less fortunate. The greater percentage of this watercolour is of a gentleman from a Southern Ontario city. He was often seen at the soup kitchen, located about three blocks from where I worked for a couple of years, and who was also highlighted in an article. The lesser percentage is of a gentleman from Petrolia, now deceased. 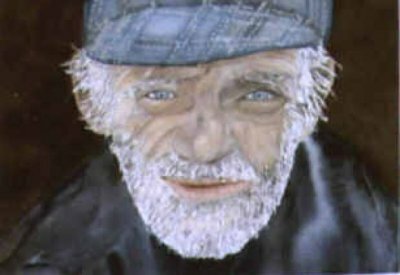 I gave 'Street Person' a blue hat and blue eyes because this produced such wonderful contrast to the darker values. Jurors for the Northern Ontario Artists Association chose 'Street Person' for the Exhibition that traveled to various galleries throughout Northern Ontario during 1999/2000. He is now hanging in our cottage Gallery and available.... framed measuring 17 1/4 " X 20 1/4 ".